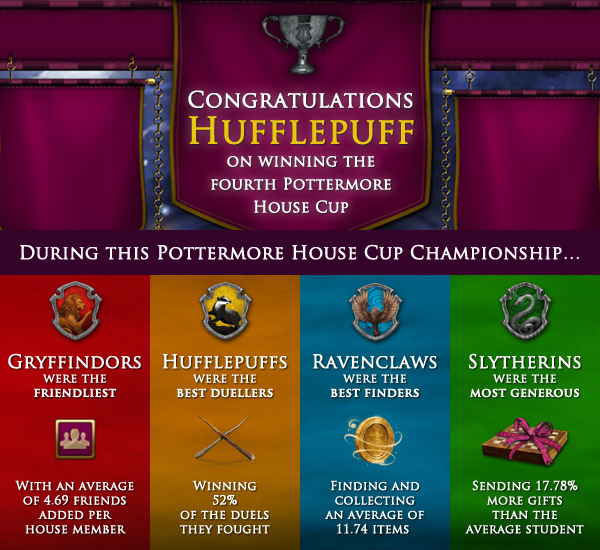 Worldstraveller's Geek Blog: Pottermore House Cup and some thoughts. Pottermore House Cup and some thoughts. 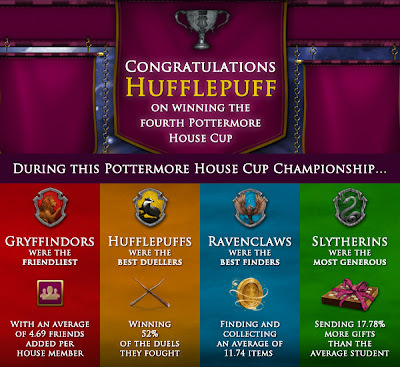 Congratulations Hufflepuff for winning the House Cup!! Gryffindors is kinda understandable, they may be arrogant/showboating and foolhardy but aren't hostile, Hufflepuffs are hard workers so isn't that surprising, Ravenclaws - different from people think, Ravenclaws are supposed to be curious, who is curious wants to find everything they can discover, Slytherins surprise me quite a lot, they are known to be selfish, not wishing to generalize, I think it may have to do with those who wanted to be in Slytherin and forced their way, just a good amount, not every Slytherin, oh well, we have to remember the Malfoys donate many times St. Mungo's Hospital for Magical Maladies and Injuries, Bellatrix to Voldemort and quite caring about her sister Narcissa, also there is Narcissa Malfoy who was generous to Harry for her own son in Deathly Hallows, Snape protecting son of the woman he loved and of the man he hated, so sometimes we have to reconsider.